'Magick' is not to be confused with the stage magic of pulling rabbits out of hats and sawing people in half. 'Magick' is the real thing - no, not sawing people in half - but of making things happen 'as if by magic'. Without trickery. Once the simple criteria are met, once you set a magickal process in motion, it is like a ball kicked down a slope: it cannot fail to reach the bottom. I cannot imagine a life without magick. Magick is what makes it tolerable, for I know I can get what I want when no other means are available. I have practised magick ten years. I am an initiate of secret orders and teacher of the arcane arts. 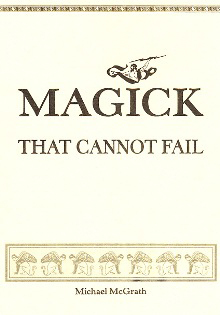 In my booklet, I explain the magick that CANNOT FAIL. I have no time for mere mumbo jumbo. I take magick seriously. With the same attitude, demonstrated in my booklet, you will not fail. I cite stunning examples of magick at work. These actually happened. They are not figments of my imagination, bogus stories for entertainment; they are not there to merely help to sell a book. I am bound by magickal oaths not to deceive and not to lie, but to teach the truth - the truth of magick. A long term unemployed man seemed to have no chance of getting the job he wanted. WITHIN TWO WEEKS, HIS LUCK CHANGED COMPLETELY AFTER FOLLOWING MY MAGICKAL INSTRUCTIONS. And he didn't know a thing about magick. You don't need to know anything. before there was science, there was magick: it was the way for making the 'impossible' happen for those 'in the know'. A friend tore ligaments above and below the knee, and was told by doctors that it may be six months before he could walk properly again. Thanks to simple, practical magick, he was walking and running again after two weeks. WITH MAGICK, NOTHING IS IMPOSSIBLE. A woman was given up for dead after a brutal attack. Recovery seemed impossible. A magickal ritual was performed for her. She was discharged from hospital after five days. Doctors said 'it was a miracle'. I knew different: I couldn't tell them so, for I would have been laughed at. Those with magickal knowledge know that the strangest things happen. Applied correctly, MAGICK CANNOT FAIL YOU. You don't need experience: you need only the desire to succeed. The alchemists and magicians of old - the wisest and cleverest of their time - practised the principles explained in my booklet. What worked for them, can work for you. The principles of magick are unchanging and eternal. The Church says magick is 'evil'. This is nonsense. The Church has always feared the power it gives to the otherwise powerless. In my booklet, there is no evil, though I do show you how to exact revenge on one who has wronged you. With magick, you can settle scores. YOU CAN HAVE ALL THE MONEY YOU NEED, THROUGH MAGICK. You will be astonished at what can happen after the pronouncement of one simple magickal prayer. In my booklet, I will tell you of an occultist who had been reasonably successful with her spells, but could never get them to bring her money. We discussed what she should do. She was thrilled at the results. Money seemed to be coming 'out of thin air', she said. My booklet consists of serious, practical, WORKABLE magick. It is not a rag-bag of bits and pieces picked up from here, there and everywhere. THIS IS THE GENUINE ARTICLE. Correctly applied, it CANNOT FAIL, it's efficacy is as sure as the law of gravity. Whatever your need, it works. A young man came to me, frustrated by his feelings for a woman who seemed unobtainable. Very beautiful, she lacked no suitors. The magick I explained to him worked. AFTER FIVE DAYS, SHE APPROACHED HIM. Things took off from there. The immutable laws of magick were in action again. In magick, there are no 'coincidences'. Things happen because they are intended. Another young man was devastated at losing his girl to another. He turned to me: I told him what to do. WITHIN THREE DAYS, SHE RETURNED. Not a 'miracle' - only magick, correctly applied which cannot fail. Yet another youth, also an occultist, was experiencing problems with his girlfriend: it seemed her best friend was trying to split them. I discussed with him how to get a definite result through magick, rather than the hit-and-miss approach of his usual occult workings. IT WORKED, naturally. The couple became even closer. WITH MAGICK, YOU CAN BIND ANYONE YOU CHOOSE. That is, control them. Perhaps that doesn't sound ethical, but if the alternative is that they control you or make your life difficult - well, that can't be ethical either. With magick, you can protect yourself. Defend and attack, if need be. And so long as your cause is right, YOU CAN BREAK UP ANOTHER'S AFFAIR. But think carefully before you do it: FOR THIS WORKS AS SURELY AS RAIN FOLLOWS THUNDER. If you think you are cursed, or that something is behind your bad luck. YOU CAN BREAK THE SPELL. You can rebound it on the sender. You can have undreamed of personal power with magick, in perfect safety. No harm can befall your person or your soul. A group of highly talented musicians were down on their luck. The group's career just couldn't get moving. To the group's leader, I explained the magick rite for changing luck. He believed in magick. he got a result, and was offered a tour, three TV appearances and a radio interview. Moreover, they suddenly received an unexpected sum of money enabling them to buy new equipment. Now he is working magick again: this time for a record deal with a major label.